With a digitized newspaper follows a new toolset for advertising, enabling new ways of engagement. One such tool, that ought to attract the attention of publishers ambitious on maximizing revenue, is the interstitials. Their potential is indisputable, but many publishers still haven’t embraced them. And that could prove to be a huge mistake. As the name depicts, interstitials are literally ads between instances occurring in a user session, which in terms of the ePaper translates perfectly into appearance between articles of the ePaper. By covering the entire interface of the ePaper, this advertising format inevitably attracts the readers’ attention, drastically improving chances for them to hit the call to action. The effectiveness of the interstitial is truly compelling. We’ve looked closer at 12 ePapers, actively using interstitials to shed light on their revenue potential. In addition, we provide you with a critical set of best practices, enabling you to achieve the best results, making the right pricing decisions, and increasing your revenue streams. When comparing the interstitial to the Clickable Ads of the ePaper, which in itself is a highly prominent advertising format (read more about Clickable Ads in the ePaper), in terms of average Click Through Rate (CTR) performance, the outstanding effectiveness of the interstitial becomes evident. Comparison of selected advertising formats' performance. The Interstitial (ePaper) performance is derived from our custom developed tracking measures among 12 newspapers actively using interstitials in the ePaper. Similarly, the Clickable Ads' (ePaper) performance is derived from 118 newspapers actively using Clickable Ads in the ePaper. As you see in the figure above, interstitials on average experience CTRs more than four times greater than Clickable Ads. When further exploring the CTR performances achieved by the individual newspapers, as illustrated below, there is a notable difference between the best and worst performers. Even the worst CTR of 1,7% is rather impressive, however, what is truly interesting is how the best performing interstitials distinguish. Comparison of the average Click Through Rate achieved on interstitials for 12 newspapers actively using interstitials. To exploit the full potential of interstitials, there is a critical set of best practices you will have to know about. These are related to campaign length and placement in the ePaper. For how long should the campaign be running using interstitials? This is inherently a question to deal with when planning advertisement campaigns. And for this reason, you need to know how the campaign length influence the CTR performance, both to provide proper guidance to the advertisers and to make the right pricing. 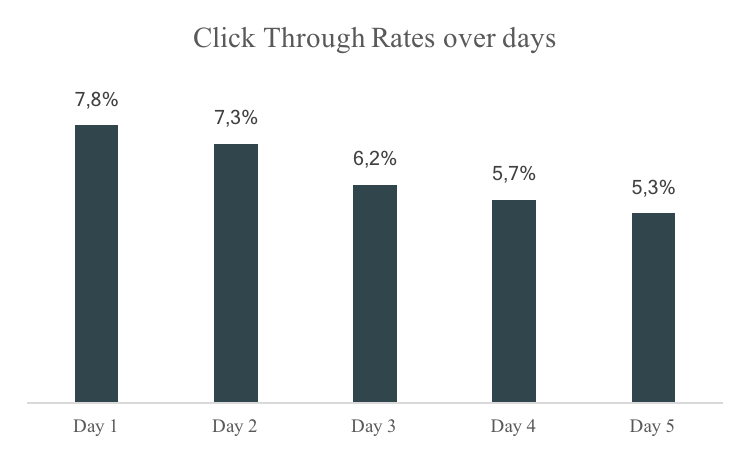 Daily average Click Through Rates of a high performing advertising campaign running over the course of five days. As you see in the figure above, there is a clear link between the number of exposures and disinterest in the advertisement. This makes good sense, as an interstitial appearing in a newspaper published daily often is seen by the same reader multiple times, and thus readers likely to take action do so early in the campaign. But make no mistake - the interstitial in the example above still, on day five, experiences a CTR greater than 5%! For this reason, great economic value can lie in extending interstitial campaign length. In this respect, of course, knowing your readers’ reading pattern is key. You don’t want to risk irritating your loyal readers. 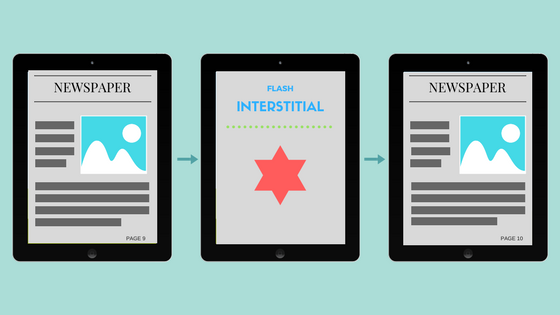 When deciding on how and where the interstitial should be placed in the publication, you have two main options to consider: placing the interstitial by a certain frequency in terms of swipes or by a specific location (after a certain page). 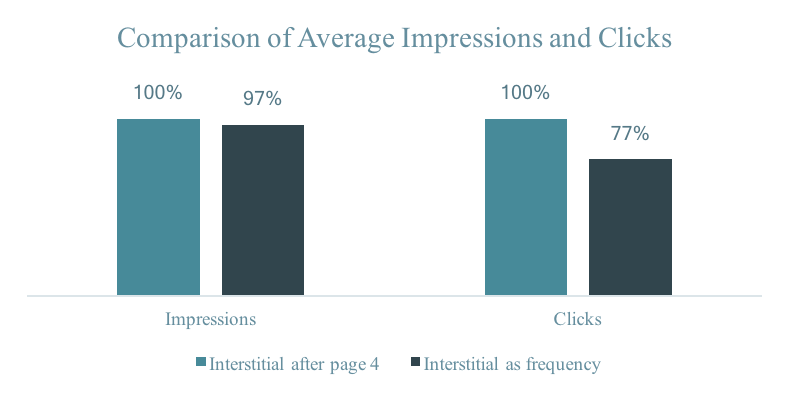 To help you make the better choice, below figure presents a comparison between an interstitial placed after page four (specific location) and an interstitial placed by the frequency (after every sixth swipe). Comparison of two interstitials placed by specific location and frequency. The comparison is based on impressions and clicks and the results are indexed. The interstitial placed by a specific location clearly outperforms the interstitial placed by frequency. As such, placing the interstitial by specific location seems the better choice. But it’s important to establish, that there is no universal solution to which approach is best. There are also cases where multiple exposure in the same session, as achieved by placement by frequency, makes perfect sense. The rule of thumb is that your interstitial should interrupt as little as possible. In general, that means you should avoid placing the interstitial in the ePaper at a point where the reader is heavily engaged with the app, for instance while reading an article. Here, locations in between articles are always the better choice - which is easiest obtained by placement. Platform (should the campaign run on Android, iOS, Windows, Desktop or what combination)? If you prefer a more automated setup, the interstitials feature also supports integration with Cxense, ADTECH and Google DFP. Interactive interstitials can help performance and increase the potential economic value. You can read more about our six interactive formats by following this link. Putting it all together, you as a publisher have great opportunity to take advantage of the frequently overlooked source for maximizing revenue - the interstitial. By providing advertisers with the best practices, outlined in this post, and performance data on their ad campaign, by means of your analytics setup, you strengthen your position to bargain premium prices. Visualization of cost compared to potential revenue, cost differs per newspaper. And with premium prices, Interstitials are extremely profitable. The only costs tied to interstitials are the sale of the advertisement slot and the booking itself, taking no more than 10 minutes, and as a result, costs are kept at a minimum. Additionally, more of the examined media houses successfully charge well above 1.000 EUR per interstitial, leaving a very attractive profit margin per interstitial that provides your ePaper with a strong ROI driver. If you want to start selling and booking interstitials today, and learn how to increase their performance, feel free to get in touch with our Business Consulting department or contact me directly using this email: mam@visiolink.com.